A dedicated group of local civic boosters have been working to add a third museum to Winterset. 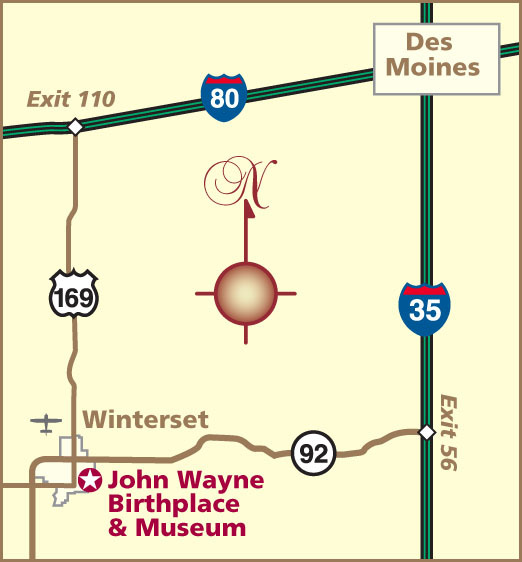 In addition to the Madison County Historical Complex and the John Wayne Birthplace Museum, the Iowa Quilt Museum (just around the corner) is set to open in May 2016 just in time for the annual John Wayne Birthday Celebration. Culturally, the gallery will promote the understanding of quilting history in America as well as an appreciation of quilt styles specific to the Midwest. The museum will also provide quilt enthusiasts opportunities to learn more about what many historians consider America’s premier folk art. “The Iowa Quilt Museum promises to be an aesthetically beautiful and culturally valuable institution, not just for Madison County but for all Iowans as well as visitors from the world over who find their way to the heart of the Midwest,” says founding member and renowned quilter Marianne Fons. For more information visit www.iowaquiltmuseum.org.